Opening Space in San Diego this week. I did a large-ish department’s annual meeting last year and that is being repeated in OS this year, finished this morning. Wonderful to sit in the circle and talk “practice” with 30 or 40 people who’ve now done this twice and are keen to soak it into the rest of their year and work. Keen too, to share it with the rest of the organizaiton. We’re going to do that in a couple days, when we open again for 100 or so of the management team. This is a new one for me, opening for subset and then opening just days later for the whole (and many people totally new to Open Space). Already, it’s made for good conversation about what this department has learned, and how it will be same and familiar and also very new and different to go now into Open Space with the larger organization. Also… Hoping to meet up with OS friend and colleague Raffi Aftandelian while I’m here. Went over with the meeting group for dinner on the deck of the USS Midway. (a very BIG boat, but very small airport. amazing.) A bit more noodling on the Four Practices (previous post), too, which I’ll see about posting later. Here’s a pretty good shot of me Opening Space at the Scrum Alliance gathering I facilitated recently in Chicago. This is a pretty good view of open space about to happen. Circle of 200+ people, many of them leaning in, listening. A big blank wall, grid of post-it notes at the end of the wall, me in the middle doing a quick briefing. Then they filled the wall with dozens of sessions, scheduled, conversed, typed, posted. The remarkable thing about this particular gathering is the number of people who came up to me along the way, or mentioned in the large group comments, that they are using open space technology as a regular part of their business practice. Monthly meetings, staff meetings, project kick-off meetings, crisis pow-wows. All sorts. All very encouraging, too. romy shovelton emailed today, from her farm in wales, asking about mixing open space and appreciative inquiry. it turns out i have a pretty good story of such mixing, from grassroots to new national government, that i’d been meaning to update here. on my third visit to nepal, i helped convene and facilitate a third open space event there, this one a first national summit for peaceful development. the first two meetings were a classroom presentation/demonstration of open space technology, for about 20 students and faculty at kathmandu college. the second was a city-wide event, organized on the success and with the skills gained in the first session, looking at the 20-year future of kathmandu. at this second event, i made a point of having side conversations with as many of the 40 participants as i could, suggesting that we might do 4 days the following year, two days of open space, followed by two days of ost training. this was a model we’d used elsewhere and i thought it could give the depth of experience needed to accomplish the things that were being discussed for the next 20 years in kathmandu. when i contacted my colleagues about returning for a third visit, they began organizing the event we’d discussed the previous year, with some important changes. it was to be four days, but it would be national in scope. it would be held in open space, but it would be based also on AI principles and the 4-D process. it would include training, as well, on both ost and ai. i never would have believed it was possible, but my nepali colleagues never thought otherwise. so we did four one-day open space events, one on each of the four D’s, the first one shortened by opening speeches, the last one shortened by a grand closing ceremony that included gifts and acknowledgements and official thank yous in addition to the usual comments in a circle. the middle days opened with ost training observations and closed with evening sessions on how to do AI. we also started a blog that they used for several years. since then they have had second, third and fourth national summits, sometimes in open space, sometimes with appreciative inquiry facilitated by ai originator, david cooperrider. along the way, in the midst of the sometimes violent maoist resistance, a 6000(? )-year old landmark gate was destroyed in an explosion that also destroyed part of one of the organizers’ homes. the village where this happened was devastated by the loss, but this organizer emailed me almost immediately, saying that they were planning an open space to talk about rebuilding gate. i don’t know if that event ever formally happened, but having it there as a possibility in such a moment is surely worth something. and now, after a fifth summit event just held in january, this one also in open space, and run totally on their own, without outside facilitators or consultants, they are planning a sixth national summit — this one for the 601 members of the soon-to-be-elected “constituent assembly” that is the budding solution to more than a decade of political, sometimes armed, in-fighting, and the governmental structure that will replace the ages-old nepali monarchy. the sixth summit will seek to infuse the new government with open space and appreciative inquiry. 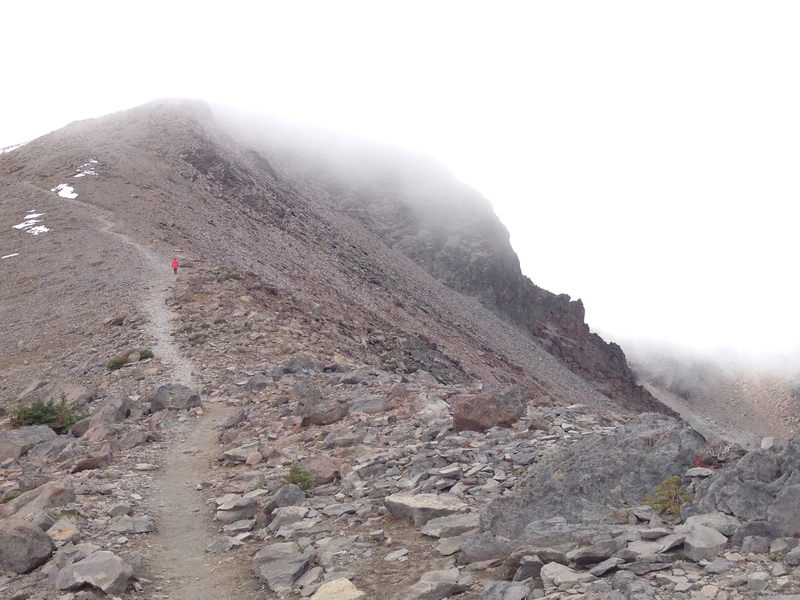 I’ve built a blogsite for the summit and we expect to post proceedings, after we get back from camp. Looking forward to a couple of days at Campfire camp, no computer, and I’m told my cellphone won’t work there either. Nice. Last September I ran into the people who make these cool (hot?) Sun Ovens. Turns out they have reps in Nepal, where I was set to do an Open Space training day in November. We made some connections and got the Nepali Sun Oven guys invited to come demo the ovens at the conference day, hoping that some of the community organizations attending would be good contacts. 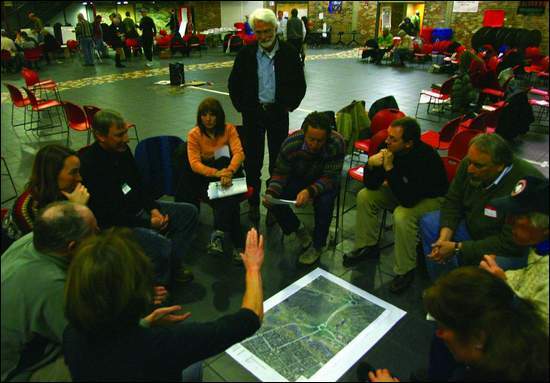 This was the scene last night at the high school in Aspen, Colorado, in the first of two open space meetings to address a set of transportation issues that has generated 26 ballot initiatives in 37 years. This is the kind of space that you do the opening, unplug the microphone, and keep it with you, just in case. Participants posted 27 issues, which after combinations generated 18 working sessions. The Aspen Times (photo) and Aspen Daily News both had good things to say about our progess on their front pages this morning. We’ll have another round on Saturday. In the meantime, today was my first time on skis in 10 or 12 years. Let’s just say that nobody skied the Greens at Buttermilk as hard as I did today! Hoping to make it a big Blues day tomorrow at Snowmass. It is our great pleasure to inform you that the third national summit of imagine initiatives of Nepal is successfully concluded on 10 September,2006 in Pokhara. The three day summit made a clear way about how NAINN, Regional Networks and Imagine Initiatives have to move forward in the changed context of Nepal. The participants discussed on the roles of AI people and organizations. The entire nation is eagerly waiting for ‘NEW NEPAL’ (NAINN’s Ultimate Goal, set in the first summit, 2004). The election of Constituent Assembly and new constitution are at the gate. We AI people and organizations have to play a vital role now so that the election and constituent will be able to address the desire, wishes and need of people. We can go to the people in the grassroots, every corner of the country and every individual. We can make the people clear how they can make their nation and future bright being positive. NAINN and Imagine Initiatives can facilitate to make the best constituent. This is what discussed in the summit. Looking forward to joining them in November, for one-day Open Space meeting to follow up on this and other work. Two years ago I worked with Phil Cubeta and some others to create something we called The Giving Conference. Since then, at least two Omidyar Network member conferences, something called Recent Changes Camp, staff meetings in Rio de Janeiro, and a bunch of other things have happened as results. Now there are conferences trying to happen in Thailand and Chicago. Phil offered the following in the Thailand planning thread. This is why my facilitation of Open Space Technology is morphing into a larger practice of Inviting Leadership. …the secret to a good open space is the invitation and also the invitation list. “Whoever comes are the right people,” but be sure to invite the right people. Go for broke would be my suggestion. Go for significant potential funders, political leaders, media, civic leaders, nonprofit professionals, thought leaders, moral leaders and religious leaders. Ask yourself who can convene these networks. Go to those “mavens” and enlist their support in not only emailing or writing the key people, but actively and personally inviting them. The real work of open space is in networking networks together. That has to be done as the pre-work before the invitation goes out. In fact, the invitation will be drafted and redrafted, negotiated if you will, by each of the co-conveners as they insert phrases of important to their networks. Michael Herman and I did this together three years ago for the Open Space on Giving. Our invitation was ultimately gibberish, because so many people pulled it in so many directions as a precondition of their inviting their networks. But the revision process led to their buy-in; and their personal invitation, not the words used, but their willingness to invite people over the phone, is what got the key players there. So treat the words as flypaper. Get key mavens stuck in the glue. The more they struggle with the the words the more involved they become, until the exact words no longer matter. Reporting today from Day Two of the Rockford and Four Rivers Regional Food Security Summit, the latest in a line of events that dates back to the original summit that was convened in Open Space by the Chicago Community Trust in November, 2001. More than 60 people, ordinary citizens that is, have gathered here at Rockford College, raised and discussed more than 30 issues, including land use, farming and gardening, food pantries, organics, community education, marketing, school lunches, fair trade, among many others. We are using a weblog to post all of the proceedings and will be experimenting with that as a platform for sustained community action. There’s a lot of life in this circle. Maybe it’s all the organic food. Whatever the explanation, meetings like this give me hope for the future. Yesterday, I opened space at the PNSQC conference in Portland OR. (Pacific Northwest Software Quality Conference) Ellen Gottesdiener (copied on this email) opened space in July at the Agile 2005 conference, also software-related. In both of those the OS ran concurrently with other sessions. Here in the NW we are planning another software-related regional conference (XP Fest NW) for next spring to be all Open Space, all the time. 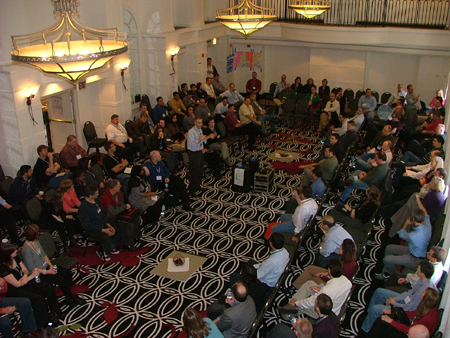 The first time I saw Open Space in a conference setting in 2002, Michael Herman opened it for the XP/Agile Universe. It’s not the ideal way to facilitate Open Space, [conference tracks] but it makes for a more enjoyable and rich conference, IMHO. The more conferences I attend with Open Space tracks, the more impatient I get with powerpoint presentations. Another thing I’ve noticed in conferences that regularly include Open Space…the senior folks and “gurus” tend to show up there and become more accessible than in more formal sessions. I’d agree with Diana. Better to run the whole thing in Open Space, but sometimes the tracks are a necessary bridge to that. Go, Diana, Go! And perhaps the coolest part about Open Space is that somebody can see it once or twice and then just dive into the leadership for themselves. It helps to have a couple of good looks at it, but after that, it’s just a matter of Practice! I just returned from the Blawgthink conference in Chicago. As the name suggests, this was a group interested in law blogging and law bloggers. You know, you’d think a room full of lawyers would be boring. You’d be wrong actually. This group was a blast. Matt’s posted comments and more comments. Looking forward to more experimentation with the BlawgThink/LexThink gang. First, the hiking was fabulous. Second, in The Conversation, the Open Space conference that was my reason for being there, we did two innovative things that bear reporting here, for future practice. One of them happened very spontaneously. We convened for the opening at 3pm, built the agenda, and then started the first working sessions in Open Space at 4:30pm. Meanwhile, 15 or so of our 100 participants were battling weather conditions, airport delays and mountain traffic in hired vans, still trying to reach us in Aspen. So we called them on cellphones and gave them the first session discussion topics. They had their sessions in the vans! The other innovation was part of the program design, in response to the sponsors’ request for “some structure” and “panel discussion.” How did we build a structured panel discussion in the middle of Open Space? We picked the five panelists from participants, but not until just a few hours before the “discussion.” We asked them to talk about their experience at the conference, everything that was being accomplished, and also to look forward at what was yet to be done or discussed. We put them in the center of the room, rather than at the front. And we did it at the end of 1.5 days of Open conversation, the evening before what would be the closing half-day for action planning. It worked perfectly, in that we allowed for panelists to tag or be tagged by others, so that those center seats could rotate. After a couple of rounds, the panel broke down, into one big circle with a talking stick. The structure gave way to community. We heard ideas, insights and appreciations from many people, which did an excellent job of setting up the next conversations, convened on the last morning. Next time, I’d put 6 chairs in the middle and use that empty chair as invitation to come join, and the signal that somebody should leave the panel. The Conversation event was a great success, by all accounts. Two accounts of The Conversation, one from the event and one from the vans, were published in newspapers and are posted in my wiki notebook. Reporting in from Aspen, Colorado, where I will be facilitating The Conversation, a large-ish Open Space Summit on the future of what it means to be Jewish in America in the 21st Century. Where else to have this visionary meeting, but on the mountain top? Some interesting innovations built into the program, to be reported on later this week. Aspen itself is absolutely gorgeous. I always breathe better in Colorado. I love it here. So much more space, room to breathe. My theory is that the mountains make us more aware of how far we can go up, but whatever the reason, it’s working for me. Looking forward to having Jill here later in the week. Meanwhile, there’s a big climate change conference finishing up just before we start. Al Franken almost ran me over coming around a corner in the hallway today. Theresa Heinz Kerry standing next to me at the front desk as I was checking in. And Al Gore passing by later this evening. Too bad they’re not working in Open Space! Oh yes, and I guess the John Denver festival is just wrapping up, down the road a piece. Woohoo!